Russia’s unmanned Progress 59 freighter launches atop a Soyuz rocket from Kazakhstan’s Baikonur Cosmodrome on April 28, 2015. Progress 59 never made it the International Space Station; it was doomed by a problem with the Soyuz’s third stage, Russian space officials say. A robotic Russian cargo spacecraft failed to reach the International Space Station as planned last month because of problems with its rocket, Russian space officials say. 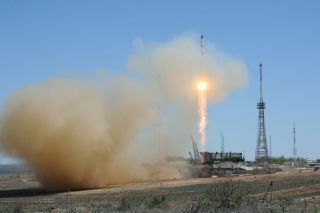 The unmanned Progress 59 space freighter blasted off atop a Russian Soyuz rocket from Kazakhstan's Baikonur Cosmodrome on April 28, and was tasked with delivering about 3 tons of food, fuel and other supplies to the orbiting lab. The Soyuz rocket launches both astronauts and cargo to the orbiting lab. As a result of the Progress 59 news, NASA, Roscosmos and their International Space Station (ISS) partners have decided to push back the next crewed Soyuz launch — which will bring three new space fliers up to the orbiting complex — by about two months, from May 26 to late July. Therefore, the next manned Soyuz liftoff will take place after the next robotic Progress launch, which is scheduled for early July. "The decision to delay the next crew launch until AFTER the next robot resupply mission was prudent, and takes advantage of the ISS program's flexibility, robustness and contingency reserves management strategy," veteran journalist James Oberg, who has written extensively about the Russian space program, told Space.com via email. The investigation into the Progress 59 mishap continues, and Roscosmos officials say a final report is expected on May 22. Whatever the conclusions of that report may be, lessons can already be drawn from the accident, Oberg said. "This and recent similar failures highlight the foolishness of judging mission success reliability based on historical statistics. It's not just that each launch is a new roll of the dice — it's a first roll of NEW dice," he said. "The quality of fabrication and mission preparations reflect the CURRENT human and industrial context, and Russian space industry leaders have been so alarmed by those levels that they've repeatedly replaced the Russian Space Agency head with outsiders with nothing to show for it."